Well here’s a frightening scenario. For the first time, the world is on the threshold of technology that would give a government the ability to follow anyone anywhere, and everyone everywhere. It could know exactly where you are going, where you have been and where you were yesterday as well. And this has profound potential ramifications for even just the fundamental civil liberties on which democratic societies rely. Before we wake up and find that the year 2024 looks like the book “1984,” let’s figure out what kind of world we want to create, and what are the safeguards and what are the limitations of both companies and governments for the use of this technology. Microsoft does build facial recognition technology, and Smith has been public in the past about the need for regulation . Facebook and Apple do, too. Amazon sells its facial recognition technology to law enforcement agencies, an arrangement that has angered some of the company’s employees who are worried about how it’s used for surveillance purposes. The logical move to prevent this is to put regulations or rules in place to limit how the technology can be used. The problem is that, at least in the U.S., politicians haven’t shown an ability to agree on much tech regulation. Even with some new leadership in place following this week’s U.S. midterms, it’s unclear if there is any kind of consensus to keep tech companies in check. Smith isn’t the only one concerned about tech regulation. 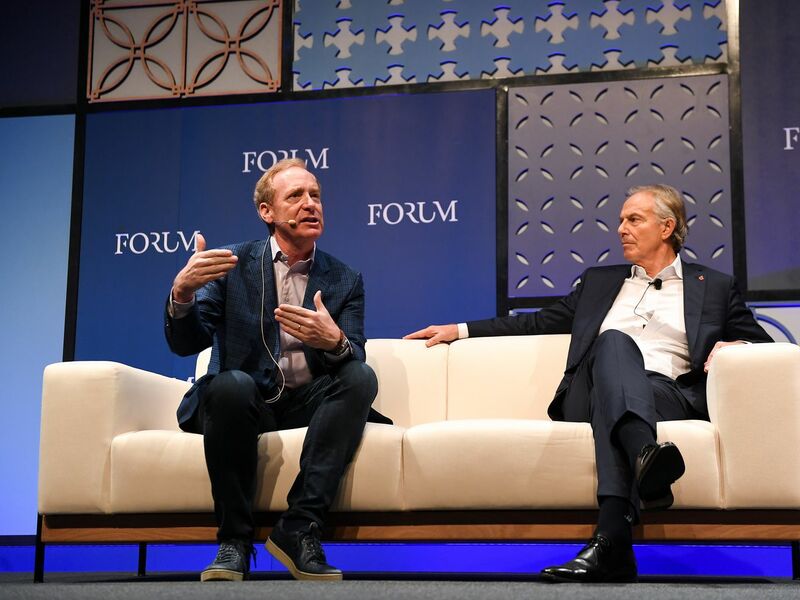 Former U.K. Prime Minister Tony Blair, who joined Smith onstage at Web Summit, also stressed the importance of tech regulation. Blair believes there is a real pessimism around technology right now — which also means an opportunity for politicians to lean into regulation and use that to shape a positive story around how technology will impact people’s lives moving forward. “The first group of politicians to seize that opportunity and to create that narrative will be the ones that [own] the future of politics,” he said.